Many employers require all applicants for employment, regardless of the job they apply for, to complete a job application form. You may be asked to submit a job application even if you have applied for a position with a resume and cover letter. This way the employer will have consistent data on file for all applicants. A signed (paper or electronically) application for employment also serves as your verification that the information you have listed on the application is true. Providing inaccurate information can be grounds for termination of consideration for hiring or of termination of employment if the erroneous information is discovered after the individual is hired. What is a job application form and when is it used? 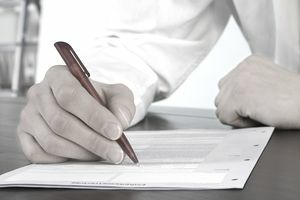 Job application forms (also called “employment forms”) are part of the formal hiring process companies sometimes use in order to ensure that they have gathered comprehensive, accurate data from all applicants. These forms often request certain information that is not always included on resumes and CVs, such as professional or personal references, the names of former supervisors, and / or a complete educational background. If you decide to submit your resume as a supplement to the job application form, cross-check it with your application to ensure there are no discrepancies. If you’re looking for a job, how will you apply? It depends on the employer. A job application can be completed in several ways. There are online job applications, typically completed at an employer’s website, at a hiring kiosk in a store or business, or on a mobile device using an app. In some cases, simply submitting a resume and cover letter online will be considered your application; you will not always be required to fill in the fields of a digital application form. In many cases, though, digital applications will require that you input your data directly into their system (frequently providing you the option to attach copies of your resume and cover letter as well). There are thousands of sites where you can post your resume online and complete an online job application. Sometimes you can apply online on job boards like Monster.com or job search engines like Indeed.com. Other times, you can apply directly on the company’s website. Many companies, especially retail and hospitality employers, expect applicants to apply in person. It's not as complicated as applying online, but you will need to be prepared to apply and maybe even interview on the spot. When you are using email to apply for jobs, it's important that all your communications are as professional as they would be if you were mailing a paper application. Here's advice on how to submit job applications via email. There are paper job application forms that you fill out if you apply in person for a position. The following is an example of a paper job application. It also includes the information you'll be required to input if you apply for a job online. Print and practice filling out this job application form to use as a guide when completing applications for employment. You should be prepared to detail each position for the past five years and account for any gaps in employment during that period. As shown above, you will be required to provide your contact information, your work history (including companies worked for, positions held, salary and time of employment), and your educational background. Most companies will also ask you to provide references with your job application. Before you start filling out the application, make a list of all the information you need in order to apply. Have your work history and other information on hand to make it a more straightforward process. To get started, review these tips on how to complete an employment application. Some employers may have you take a talent assessment to see if you are a strong fit for their organization. If an online test is part of the application, they will provide instructions on how to complete it. It is important to know that providing inaccurate information on the application can result in termination of consideration for hiring. If the employer discovers the erroneous data after hiring the individual, it is grounds for termination of employment. In fact, applicants must sign the paper or electronic application to verify that the information they have provided is accurate. So, be sure to triple-check your application after completion to ensure everything is true.